Complete Set of Free Racing Kart Plans. 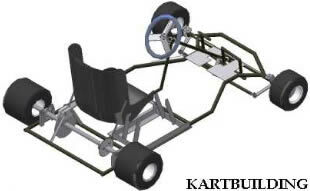 These plans contain information on how to build and construct this racing kart. They contain all the necessary details, including nuts, bolts and washers. Plans can be viewed using Adobe Acrobat which is typically installed on most computers. Lastly - if there are any details you feel are missing from the Complete Set of Racing Kart plans below, please email me and, and I will endeavour to add them to the set below. 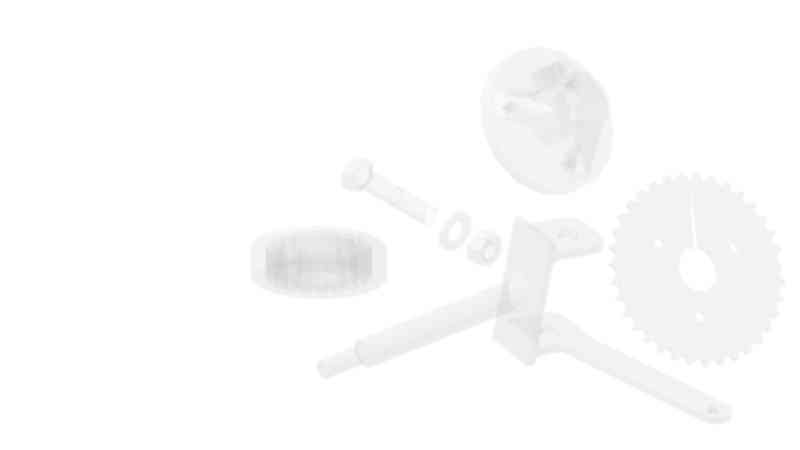 This set of Racing Kart Plans do not cover transmission, drive setup, nor engine or brake selection. These Racing Kart Plans, unlike the Free Off-Road Kart Plans do not cover alternative methods of making the Kart, and assume bearings, bushings, wheels and hubs are purchased from a local engineering Suppliers. Please refer to the other sections on this Kartbuilding website for these extra details on engines, brakes, bearings, drive & transmission, wheels, steering etc. There is a seperate 1 page PDF for each area of the Racing Kart. They are arranged from 1 to 20, in the order you would begin to make the kart, i.e. : No. 20 is the last stage of making the Racing Kart. These step by step drawings shows the assemblies, sub assemblies and details of over 40 components. Details for each drawing and step will be outlined below, with information on changing parts and components to suit your budget. This Drawing (click on link above) shows the Overview, Layout and Dimensions/Size of the Racing Kart. You will also be able to see the various pieces involved in making up the racing kart - from the seat, to the wheels, to the axles etc. The main dimensions of the Racing Kart are: Length 1.6meters x Width 1.2meters, and will cater for the average-sized driver. The placement of the seat, the engine, the steering wheel and the pedals can be seen. Note that the placement of the engine and seat is up to yourself and does not matter much. The main reason the engine is on the right of the driver is because on motorbike engines, the gear-change is generally on the left of the engine. Thus with the engine on the right, only a short gear lever is required which provides positive gear change. The steering column & wheel and Pedals can easily be angled to one side so that they are within easy reach of the driver. There are several other features such as roll-bars/cage, emergency kill switch, chain guards, suspension etc. which can easily be implemented into this design. The Labelled Overview of the Racing Kart helps beginners identify key parts of a kart, the names of which can sound complicated at first. Key parts to identify are "King Pins", "Steering Column", "Track Rods", "Front Stub Axle", "Support Bushings", "Brakes" etc. Each of the individual parts and components within this drawing #2 will be discussed and detailed further in drawings #3 to #20 below. The chassis is the most important piece/section in the entire kart. All other parts and components can be changed at a later date. As a result - a good deal of time must be spent planning, drawing out, cutting, and welding the chassis together. The dimensions given are suitable for an average sized driver. You can test and confirm these sizes easily, by placing the components (wheels, engine and seat) to the layout in this Drawing. Place yourself in the seat, and make sure there is enough room for the seat, pedals, steering wheel etc. The front raised bumper and the "King Pin Mounting" should be left until last. The chassis is made from 25mm outside diameter tubing with a wall thickness of 3mm for ease of welding via a MIG or MMA/Stick Welder. It would be advisable to draw out the chassis on the ground using chalk, and cut the lengths of tubing based on this. The lengths of tubing can then easily be tacked in place with weld. Measure the chassis to make sure it is square, true and not twisted. Concrete blocks can be used while welding to secure the tubing flat to the ground. If you have access to a Pipe Bender - it would be advisable to bend the right and left front sides from one length of tubing. The reason the chassis is narrow in the front middle - is to allow the chassis to twist (a little bit) when going around corners. The chassis must be able to twist, otherwise the kart will not steer around corners correctly, and instead move in straight lines only. The Camber angle produces the small twist/flex in the chassis when cornering. You will notice the Camber angle on a Car when the steering wheel is fully locked to the right or left. The Front wheels of the car will be angled at 85degrees to the ground providing better traction, and better cornering. before been fully welded together. The Castor angle helps keep the front wheels pointing forwards, and as a result, if the steering wheel is let go - the kart should go in a straight line. The "King Pin Mounting" piece is shown in its simplest form with NO bushing been used. It is simply a piece of 25mm diameter metal bar, 65mm long, with a diameter 13mm hole in the center (13mm is the diameter of the King Pin Bolt been used to attach the Front Stub Axles). A special brass insert can be fashioned and used also. Make sure also that there are NO holes drilled or as a result of welding, in the main members of the chassis as this will weaken it greatly. Grind all welds using a file or angle-grinder making sure they are sound. It would be a good idea at this stage to apply a primer and coat of Hammerite metal paint to the chassis. The Front Stub Axle and King Pin is one complete piece, however there is a Left and Right hand piece - so they are NOT identical. Only the Left hand Front Stub Axle and King Pin is outlined in the above drawing. With some common sense, a Rigth hand part can easily be fashioned. The "n" piece of the King Pin is made up by welding 3 pieces of flat steel to form a "n" shape. The steering arm is then welded to the King Pin (n shaped piece). Note this steering arm can be welded to the top of the King Pin to provide for greater room. In the plans above it was placed at the bottom, putting the track rods under the chassis and thus does not interfere with the Drivers feet etc. The angle of 110 degrees is a calculation from the Ackermann principle which is further discussed on this website here and here. The stub axle piece itself is welded onto the side of the King Pin. If you dont have access to a Metalwork Lathe to produce the piece as in the above Drawing, it can be made simpler by, obtaining a diameter 20mm metal bar, 125mm long. Obtain a 13mm Bolt, and cut the head off it. Then weld the 13mm bolt to the end of the 125mm long metal bar. Finally to prevent the front wheel from moving in on the Stub axle, obtain a piece of tubing, inside diameter 20mm and outside diameter approx. 30mm. Weld this small piece of tubing at the correct distance on the inside of the front wheel. The 78degrees angle is to counter-act the 12degrees Camber angle as was covered in the Chassis Drawing. Attach the Front Stub Axles and King Pins to the Chassis using 13mm High Tension Bolts with Locknuts and washers in the appropriate places. Both Front Stub axles should now pivot and move from side to side. The "Track Rods" will tie together the Steering Arms which are welded to the King Pins. This will be outlined and covered later on in Drawing #12. The Rear Axle Carrier allows the Rear Bearings to be secured to the chassis while alloing the rear axle to rotate freely. There are two plates which squeeze very tightly either side of a normal roller bearing. These roller bearings are cheaper than a purchased unit but are not the ideal method. When buying these bearings, and making the axle - you must ensure that there is a VERY TIGHT FIT between the inside of the bearing and the outside of the axle. Otherwise the axle may spin inside of the bearing - and the bearing would not serve its purpose at all! The Drawing above shows a very secure, however complicated method of attaching these bearings to the Chassis. Instead of making the rectangular enclosure, it would be possible to weld a single vertical steel plate (6mm) to the chassis, and then to use the Triangular pressure plate to squeeze the bearing, securing the outside rim of the bearing tightly while allowing the inside rim/center to rotate freely. Diameter 8mm High Tensile Steel bolts are then used to squeeze either side of the bearing as can be seen in the above drawing. Make sure to use Washers and Lock nuts so they will not loosen over time. An easier option to the above would be to purchase "Pillar Bearing" units which simply bolt onto the chassis. These can be sourced from your local engineering suppliers. The Rear Axle can be fabricated using several methods, and depends on whether you have access to a Metalwork lathe and Milling machine. The Axle itself is simply a 1100mm long solid metal bar of 30mm diameter. Ideally there would be "keyways" Milled/Ground into this metal bar, which in conjunction with a metal "key" will stop the rear wheels, sprocket and brake carrier from spinning freely on the axle. The idea is that the Wheels, Sprocket Carrier and Brake Carrier all spin with the Axle. This is referred to as a "Live Axle" - i.e. the Axle itself spins (as opposed to a fixed axle). It might be possible to use an Angle-Grinder to cut/grind out these keyways. It might also be possible to weld the Hubs of the wheels and the Sprocket Carrier directly to the rear axle - however it is not recommended. Although welding the wheels to the rear axle provides a quick fix, if the wheels want to be changed, or a sprocket changed etc. all the welds will have to be ground off (which is a tedious task). You will also notice 2 shoulder pieces (diameter 40mm, 25mm long). These are pieces of tubing etc. which are either welded (via tack welding) or grub screwed to the axle. These shoulders prevent the Axle itself from sliding/moving left and right in the middle of the Rear Axle Bearings. Note: If you purchased and are using "Pillar Bearings" - you should not need these shoulders, as the Pillar Bearing units provide an inbuilt grub screw stopping the axle moving from side to side. This Drawing #7 shows the Details for making/buying suitable Wheel Hubs which are used to attach the wheel to the Rear Axle. Note: Some wheels do not require a hub. A large trolley/ wheelbarrow wheel has an incorporated hub, and does not need a seperate hub. In these cases the wheel can be placed directly onto the rear axle, and bolted/welded in place. Wide racing kart wheels however do require a Hub to secure itself to the rear axle. You can choose to buy the appropriate hub for the wheel you have, or attempt to make a proper hub yourself. It would be possible to make a simpler hub. The measurements and details for the Hub in this drawing are a little complicated for the average person to make, but it shows the key parts required in a typical hub, which are: A Matching Keyway to that on the Rear Axle, A Pinch Bolt to tighten the hub onto the Rear Axle to stop it moving from left to right. The Brake and Sprocket Carriers are the Exact same as the Hubs used for the Rear wheels. Extra holes may have to be drilled into the Brake Disc and the Sprocket in order to accept bolts. Use 8mm High Tensile Steel bolts with washers and Lock nuts. There are a few options which can be taken when installing Brakes onto a Kart. Typically it will involve placing a "Brake Disc" onto the rear axle, and then having "Brake Callipers/Shoes" fixed to the chassis. This Drawing shows just that - the placement of the Callipers and Brake Disc on the rear axle, and the support brackets required to secure the Callipers, preventing them from rotating. Note: Depending on the speed of your Kart - you may require brakes on the Front wheels - however this requires more work and plans. For the moment - Brakes on the rear axle should suffice. For sourcing the Brake Disc and Callipers, it would be best to take the whole complete front unit off a small Motorbike. Leave all the hydraulic brake pipes in place. Position the Brake lever onto the chassis - close to the Callipers on the rear axle. Operate the Brake Lever (off the motorbike) from the Brake Pedal via a manual cable. You can see it in action here and here. Modified Clutch Pedal (if required). Other Available Formats of the Racing Kart Plans. I have made available all formats of this racing kart that I have. If you require a format which is not listed below, please email me, and I will explore the possibility of converting the Racing Kart Plans to your required format. It is recommend to view the Racing Kart using eDrawings, which is a revolutionary new method in which all the parts of this Racing Kart can be viewed, rotated in 3d, zoomed, and measured! This allows for any distance, part or angle to be measured to give a quick and accurate measurement for use when building this racing kart. There are many other formats which can be seen below.